I am trying to figure out why this particular cooking group has existed for the last 3 years and I had never found it. I mean really! TEA TIME TREATS!! As much as I love Tea and Scones! Well, I have now and this is my first post for this group. Yes, I would like some tea, thank you! The Challenge was VEGETABLES in a Tea Time Treats – either sweet or savory. 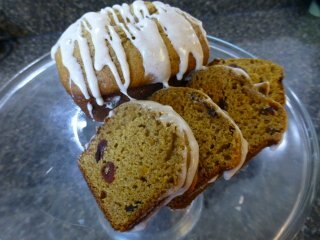 This time of the year we are harvesting winter squash so it was perfect way to use some Butternut Squash in These Mini Butternut Squash and Cranberry Cakes. You can use all AP flour, or use all sugar, or leave out the cranberries, or add in some nuts. It’s a very versatile recipe. In a separate bowl combine sugar, eggs, butternut, and applesauce. Add dry ingredients slowly to the wet and mix just until all the dry is ingredients. Yield: 2 full loaves or 8 mini loaves and 6 muffins. After cakes/muffins have cooled drizzle with Cinnamon Glaze. 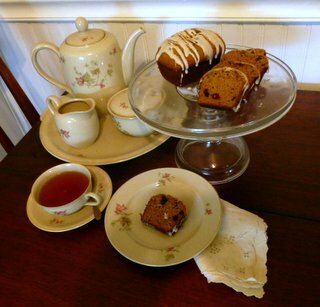 The mini loaves, sliced, are just right for a sweet tea with a good cuppa. 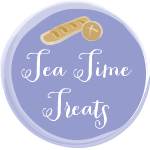 Tea Time Treats is hosted by Karen of Lavander and Lovage and Janie of The Hedge Combers This month the hostess is Karen so visit her Tea Time Page for all the wonderful Vegetable Tea Time Treats.